Chlorination is a simple and effective way to disinfect water in order to make it drinkable. It consists in introducing chlorinated products (chlorine tablets, bleach solution, etc.) in the water in order to kill the microorganisms that it contains. After allowed to act for about 30 minutes, the water is normally fit to drink. It will remain so for a few hours or a few days (according to the storage conditions) thanks to the residual effect of the chlorine. This process has been used for several decades. In the large drinking water distribution networks, chlorine is added to the water so that the water does not become contaminated while it is being transported from the treatment plant until it reaches the user. Moreover, chlorination is used on an individual, family or collective scale in many developing countries where the water available can be contaminated. It is also set up by the international solidarity organisations in emergency situations. Treating water via chlorination makes it possible to easily and inexpensively eliminate most microbes, bacteria, viruses and germs that cause diseases such as dysentery, typhoid and cholera. However, it cannot destroy certain pathogenic parasite microorganisms. So chlorination disinfects water but does not fully purify it. Chlorination is suitable in all areas where the water springs are not of sufficient quality and where suitable chlorinated products are available. Chlorine, or its chlorinated derivatives, is a powerful oxidant that, when mixed with water, burns the organic matter that it contains, and in particular the pathogenic viruses and microbes in half an hour. As a substantial amount of the chlorine is needed to neutralise these organic materials, a portion does remain however, called free residual chlorine, to treat any later contamination of the water in the network or homes. The concentration in free chlorine in the treated water must, according to WHO, be from 0.2 to 0.5 mg/l. Enough chlorine must therefore be used so that there remains a sufficient quantity once the water is treated, except in cases of immediate consumption. There are several chlorination methods, which vary according to the quality of the water to be treated. Chlorination is indeed effective only in clear water. If the water is not transparent, if impurities that can be seen with the unaided eye are present, the chlorination will be much less effective. In the case, a preliminary treatment must be carried out. If the water is clear, one can proceed directly with chlorination. The quantity of chlorinated product required varies nevertheless according to the quality of the raw water (less product will be required the clearer the water is and how far less than 8 the pH is, therefore rather acid), according to the degree of concentration of the product used, the volume of water and the duration desired for maintaining the quality of the water after treatment. It is usually considered in most cases, and if the water is clear, that 5 mg of active chlorine must be used per litre of water and wait about 30 minutes. But is the water is cloudy, it should be filtered and decanted. There are however products that perform both functions : decantation and chlorination. In any case, the first thing to do before any such treatment steps is to wash your hands with soap or with ash if no soap is available. The preliminary treatments that are high recommended, and even indispensable, are filtration and decantation. If filtration alone is not enough, proceed with a decantation. The water can be filtered using a sand filter (cf. fact sheet No. E 21 "Treatment by sand filtration", or otherwise use a clean piece of fabric. Decantation makes it possible to eliminate a large number of materials in suspension. It consists in allow the water to sit for several hours, so that the impurities can accumulate at the bottom of the container. Then the clear water is recovered, either by carefully pouring it into the container intended for chlorination, or by filtering it. The decanted water is not however sanitary as only the largest particles have been eliminated, and the harmful germs and microorganisms are still present. Decantation can be favoured by adding certain chemical products such as ferric chloride or aluminium sulphate which causes the formation of agglomerates of impurities, which settle to the bottom more quickly. This is referred to as flocculation. The alum (potassium aluminium sulphate) and the seeds of Moringa Oleifera (a tree that grows in tropical regions) fulfil this function (See Fact Sheet "Flocculation-decantation through the use of moringa oleifera seeds"
The quantity to be added per litre of water and the instructions are printed on the packaging. In general, the procedure is as follows : if the water is clear, the tablets are put into the water, the water is left alone for thirty minutes in the closed container, and the water can be consumed. 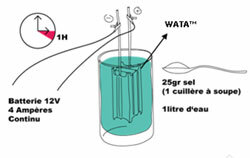 If the water is cloudy, it is filtered or decanted and then a double dose of chlorine is added, the water can be consumed after spending thirty minutes in a closed container. Waterguard is a liquid chlorine solution sold in various forms by an American company. If the water is clear, the contents of one capful of product is used per 20-litre tank of water, it is then left for thirty minutes in the closed container. If the water is cloudy, the process is the same as with tablets : the water is filtered or decanted, the Waterguard dose is doubled, and then it is left for thirty minutes in the closed container. Bleach was not originally designed to treat water and it does have some small risks when using it for this purpose. It is however a simple and effective product that villagers know well for other uses (washing, disinfection, etc.). It can therefore be used by taking certain precautions if no other means (tablets, prefabricated liquid solutions, or other purification method of the SODIS solar disinfection type, boiling, etc.) can be retained. The process is the same as indicated previously : If the water is clear, 5 to 10 milligrams of active chlorine are added to the water, the water is left alone for thirty minutes in the closed container, and then water can be consumed. If the water is cloudy, it is filtered or decanted and then 10 to 20 milligrams of active chlorine per litre are added, the water can be consumed after spending thirty minutes in a closed container. The time for action for sodium hypochlorite is at least one half hour, but if the temperature is only between 10 and 18 °C, the contact time must be at least one hour, and even more when the temperature is less than 10°C. To know the volume of bleach to add in order to obtain the desired concentration, you must know its chlorometric degree, which has to be mentioned on the bottle (pay attention however to the reliability of this information and counterfeit products in some countries). The result obtained is in ml if the concentration was expressed in mg/L. There is a recent procedure (2009), that is simple and inexpensive that allows you to make a hypochlorite solution yourself locally, either for family, community centre or dispensary use. 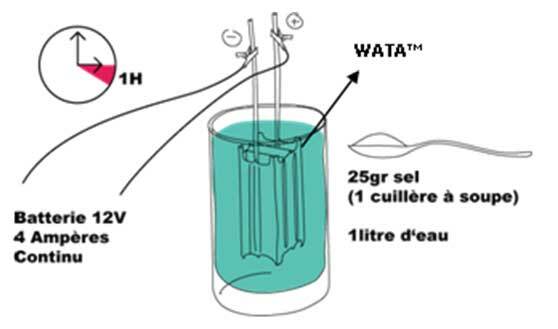 The Swiss foundation Antenna Technologies has indeed perfected the WATA, a small device operating on the principle of electrolysis which, starting with clear water, salt and electricity (even a car or solar battery is sufficient) transforms the dissolved sodium chloride salt into hypochlorite. Such a device can, in the smallest model available, produce a litre of hypochlorite per hour, which equivocates to treating 4,000 litres of water/day, which can be enough for 150 to 200 people, at a price of about €45 per device. This process is currently in use in about fifty countries. Contrary to most of the other chlorinated products, it has the advantage of producing it on site, which makes it less expensive, and to be able to operate for a very long period of time (in principle, around twenty thousand hours). There are products that provide both decantation via flocculation (as is the case with alum and Moringa Oleifera seeds) and water treatment. There are in particular two products that are rather widespread : PUR (Purifier of Water) and Watermaker. The effectiveness is about the same. They make it possible to make muddy water fit for consumption, but are more expensive. The following two (Pur and Watermaker) are furthermore a little more complicated to use than the previously exposed means. PUR packets are manufactured by Procter and Gamble at a price of about ten USD cents per packet. They contain 4g and are designed to treat 10L of water. Pour one packet into a 10L bucket. Mix for 5 minutes in order to favour the flocculation action of the chemical product, then let sit for 5 minutes. If the water is still not clear, repeat this step. Then filter the contents of the bucket using a clean piece of fabric without holes (made of cotton, preferably). The water can be consumed after 20 minutes of waiting time. If it is still yellow, it must not be consumed. Watermaker packets come in several formats (5g for 20L or 2.5g for 10L). The contents of the packets are poured into a bucket of water that contains the appropriate volume. Mix for 5 minutes in order to favour the flocculation action of the product, then let sit for 15 minutes. Filter the water with a clean piece of fabric. The water can be consumed immediately. If it is yellow, it must not be consumed. This product is marketed in the form of two-layer double-sided tablets that successively carry out a double action of clarifying and disinfecting water. The first is made up of a coagulant, iron sulphate, and the second of sodium dichloroisocyanurate for chlorinating and disinfecting the water. 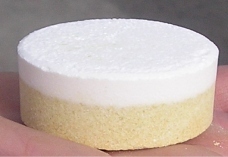 Aquasure tablets bring these two products together on the same medium by separating them with a product that, when the 1st layer dissolves in order to cause flocculation, prevents the second from starting to act (that water must already be clear if chlorination is to be effective) and causes it to rise to the surface by dissolving in turn in order to allow the chlorination to start. The rate of final residual chlorine after treatment is from 0.5 to 1 mg/l, which indeed corresponds to the standards. One tablet can treat 200 litres of water but cannot eliminate organic materials in very low concentrations such as pesticides. The product is currently sold in kit form containing 6 kg of tablets (which is 150), which is supposed to correspond to the needs in an emergency for a population of 1000 people for 5 days (based on 5l of water/day/person) as well as equipment (a flexible reservoir of one m3, a pump (4 to 5 m3/h), a mixing device, a distribution ramp with 4 valves, several m of pipe, a turbidimeter and a small device to measure chlorine. The 6kg basic kit costs €3,500 inc. tax (out-of-factory price near St Etienne, in France). A kit containing 12 kg of tablets costs €4,300 and the 18 kg version costs €5,000 ? The produce has a use-by date of 2 years, which makes it easy to stock. This product is very well suited for emergency situations, especially during the first few days while waiting for repairs of the arrival of complex treatment equipment, and is currently being researched and transformed to adapt it to family needs. Chlorinated products can be harmful in case of contact with eyes. They must be stored out of the reach of children and animals, in a dry place away from sunlight. At each step of the treatment, the containers used must be clean. But, it is ideal to not chlorinate water or disinfect it, but above all take every preventive measure possible to prevent contamination of the water. People must not fall into the habit of considering chlorination as a sort of medication and believe that there is no more risk for chlorinated water to be contaminated. It is therefore important to make the population aware beforehand of hygiene and health problems so that it understands the reasons and the methods of intervention well and changes behaviour if needed. Regardless of the means used, chlorination must not precede but rather follow such campaigns concerning sanitary education. 7) Note : Should chlorination be individual or rather collective ? The choice depends especially on the situation and the context of the region or village involved. Within a village, most often the treatment is carried out collectively and this is better (for example, directly in the wells by using various systems such as that of chlorinator pots that release chlorine placed at the bottom, but care must be taken that this does not result in the population abandoning its efforts in terms of hygiene and health, or through the distribution/sales in suitable locations of chlorinated products purchased wholesale by the community). But in rural areas with dispersed habitats, individual or family systems often seem better suited and of a nature to sustainably modify behaviours. - Treatment is fast, inexpensive and relatively simple to implement. There is an interesting variety of means. - It can be used on an individual, family or collective scale. - Water treated via chlorination is normally protected from microorganisms and germs for a few days. - The reliability for these treatments is good, but it is not faultless. - The products are not available everywhere and the concentration indications are sometimes not reliable. - It is difficult to treat large quantities of water. - the dosage of chlorine is not always easy to determine. - chlorinating water can create by-products (organo-chlorine compounds) which are deemed harmful from a sanitary standpoint. - ozonation, which is produced using a high-intensity electric current that passes through the water, and which is very effective against microbes but does not have any residual protective effect like chlorine does in the pipes. Therefore a small amount has to be added. - treatment with ultraviolet rays (see fact sheet E 20), but this is more expensive and complicated to set up and this also has no residual protective effect. - the use of chloramines, which produce less by-products, but are not effective against all of the microbes but can be effective for secondary disinfection in the network.